Designated as a Super Lawyer 2005 – 2019 (top 10 in 2008, 2017, 2018 & 2019 and 15th-consecutive year listed in Super Lawyers) in the field of medical malpractice, Top 100 in NJ annually since 2005, and Top 50 women lawyers in NJ (every year since 2007). 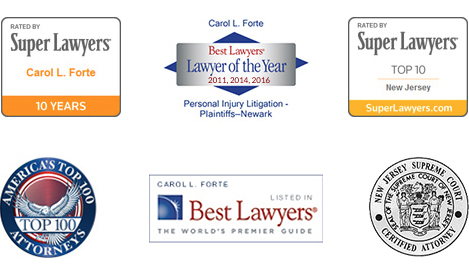 Carol was also designated one of the Top 10 Lawyers in New Jersey in 2010, 2017, and 2018 (including all male and female attorneys) and has been honored to be named one of America’s Top 100 Attorneys for her Lifetime Achievement in Medical Malpractice and Personal Injury Litigation. Listed in Best Lawyers since 2003, named as Medical Malpractice Lawyer of the Year for 2011, 2014 & 2018, and named as Personal Injury Lawyer of the Year in 2016. Listed in LawDragon 2006 – 2010 (LawDragon 500 in 2010). Click here for America’s Top 100 selection criteria information. Click here for Best Lawyers selection process information. Click here for Lawyer of the Year selection process information. Click here to view Ms. Forte’s Avvo Profile/Rating and click here to view the AVVO rating process. For more information (Curriculum Vitae), click here. According to the National Law Journal, Carol L. Forte is often cited by other attorneys as the leading female trial attorney in the State of New Jersey. In a May 2000 article entitled “Jersey Giants,” the Journal recognized Ms. Forte as one of the top 10 litigators in the state. She has been recognized by the National Law Journal on multiple occasions as one of America’s top 50 women litigators. Carol was elected a Fellow of the American College of Trial Lawyers in 2008. The College consists of the best of the trial bar from the United States and Canada. Membership is by invitation only and is extended after careful investigation to ensure that this honor is offered only to those trial lawyers who have mastered the art of advocacy and whose careers have been marked by the highest standards of ethical conduct, professionalism, civility, and collegiality. Membership in the College is limited to one percent of the attorneys in the country. Carol joined the firm in 1984 after graduating from Seton Hall University School of Law. Her prior experience as a registered nurse has proved useful in the medical malpractice cases she has handled. Some of her achievements include a $12,682,500.00 jury verdict for the parents of a severely brain damaged boy whose twin died in utero; an $8,000,000.00 settlement on behalf of a brain-damaged child whose delivery was delayed when physicians and nurses caring for his mother in labor did not recognize fetal distress; a $5,000,000.00 settlement in a product liability case; numerous multi-million dollar settlements in brain-damaged baby cases; and a $3,000,000.00 settlement for a baby born prematurely who suffered from an infection in the newborn nursery which caused brain damage. Carol has represented large numbers of women whose breast cancers were not diagnosed in a timely fashion. She has also handled cases involving delays in the diagnosis of cervical cancer. She is one of the leading attorneys in New Jersey handling birth injury cerebral palsy cases and brachial plexus injury cases in which the nerves controlling a child’s shoulder and arm were damaged during delivery. Carol is a member of the Essex County Bar Association, the Morris County Bar Association, the New Jersey State Bar Association, the American Board of Trial Advocates, and the American Trial Lawyers Association. She is also admitted to the Bar of the United States Supreme Court. She is on the Supreme Court Board on Attorney Certification and the Seton Hall Law School Board of Visitors. She has lectured for the American Trial Lawyers Association and the Institute for Continuing Legal Education in New Jersey. 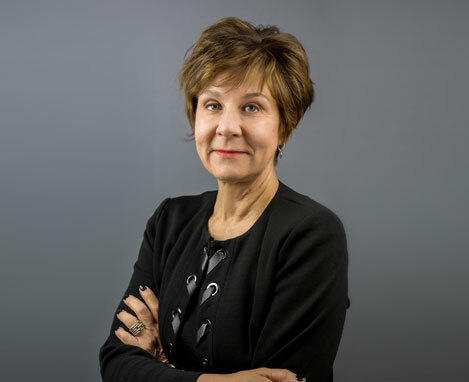 Carol Forte was recognized by the Woman’s Law Forum of Seton Hall with their Woman of Substance Award in 2003 and was the recipient of the 2002 Outstanding Civil Trial Attorney Award given by the Essex County Bar Association. The Trial Attorneys of New Jersey selected Ms. Forte as a recipient of their 2009 award given annually to deserving members of the Bar. In 2015, Ms. Forte was honored by The New Jersey Association for Justice as their recipient of the Gerald B. O’Connor Award (given for her extraordinary skill, creativity, and professionalism). In 2016, Ms. Forte was honored to be the recipient of the Lifetime Achievement Award from the New Jersey Law Journal.